After returning home from his tour in Iraq, Troy Yocum was excited to begin his next journey knowing full well that it was going to be a very difficult endeavor. He told us, "After my first step I was thinking ... Ok, just about 30 million more of these to go." With every step, he kept one thing in mind: the sacrifices that military families have made and continue to make for our country. Troy founded Hike for Heroes in 2009. It is a fundraising program whose mission is to increase awareness about the military families who are fighting just as hard at home as they are abroad. In September, Troy finished his most recent cross-country hike. 20 miles a day for 16 months. During his journey he watched landscapes and seasons change, but remained resolute that something must change to help the countless military families here at home. Last year, Hike for Heroes raised one million dollars for the Wish Upon a Hero Foundation. This year they hope to improve on that and we hope to help. Mission is proud to be teaming up with Hike for Heroes this Veterans Day to support Troy's mission. 50% of all proceeds from our Hike for Heroes Bundle will benefit the military families that Wish Upon a Hero helps support. So far, Wish Upon A Hero has granted over 82,000 wishes and has helped thousands of military families in the process. When we asked Troy about Mission's role supporting his hikes, he gave us all the details. "When I started using Mission's Max Muscle Rehab I was about a month, month and a half, away from the finish line. My body was spent. I had so many aches and pains in my knees and ankles, I was really doubting that I could make it to the finish line. 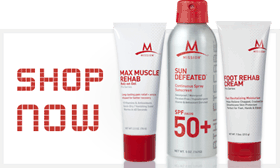 Mission sent me the Muscle Rehab - an amazing product - and within three days it really began to heal me. I could notice a big difference in how my knees and ankles were feeling. It helped get me to the finish line." Mission's Foot Cream and Anti-Chafe have also accompanied Troy on his travels. All three products are part of the bundle we are offering today to benefit Hike for Heroes. We hope you'll join us in spreading the word about their inspiring campaign. Says Troy, "A few times a year we celebrate our veterans and Veterans Day is one of the most important days that we do so. 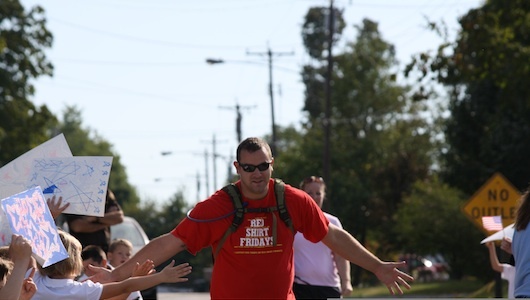 This Veterans Day, we call upon everyone to get active to help our military families." To follow him across the country and, undoubtedly back again, check out Hike for Heroes on Facebook and Twitter. Shortly, they will announce relays being held across the United States. Whether you run, walk, hike, race, or ride, you can help out. We at Mission will keep you updated on the latest news from Hike for Heroes, so stay tuned.